Trek past snow-laden mountain trails, catch breathtaking views from vantage points, stay in alpine tents at a beautiful campsite and explore the mountains of Uttarakhand. 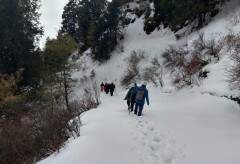 This winter trek to Devban gives you the classic winter trekking experience of the Himalayas over a relatively easy route on a short two-day itinerary. You'll be navigating remote pathways with inches of snow, climbing uphill to over 9,000 feet to get stunning Himalayan views and sleep in tents pitched under a starry night sky. All throughout, you'll explore some of the most secluded mountains of Uttarakhand. NOTE: A minimum of 4 travellers are required to book this trek to Devban. Non-Indian citizens cannot book this trek as per government regulations. Devban, a little-known village tucked away in a secluded corner of Uttarakhand, is not the most popular choice for trekkers. This allows you to explore the real beauty of the lower Himalayan mountains, the Kanasar range, at a slower pace and an authentic experience. Far away from the crowds at Dehradun, the oak and pine forests and thorny shrubs of the Undawa forests near Devban are the highlight of this trek. These forests, painted pure white with snow as far as the eye can see, attract chirping alpine birds and harmless mountain wildlife. • Embark on an easy, two-day trek to Devban. • Climb up to an altitude of more than 9,000 feet. 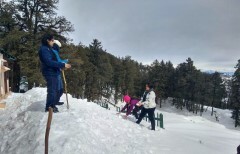 • Catch beautiful views of snow-capped peaks in the Himalayas. • Stay in tents pitched at a photogenic campsite. Travellers are required to follow instructions of the trek leader during the trek to Devban. Consumption of alcohol, drugs and tobacco products like cigarettes is strictly prohibited during the trek to Devban. For cancellations made 30 days or more before departure of the Devban trek: 100% refund. For cancellations made 15-29 days before departure of the Devban trek: 50% refund. For cancellations made less than 15 days before departure of the Devban trek: no refund. A minimum of 4 travellers are required to book this trek to Devban. The tour operator reserves the right to cancel or alter the itinerary of the trek to Devban to maximize the safety of travellers as well as staff. Travellers will be required to bear any additional costs arising due changes in the itinerary of the trek to Devban due to unforeseen circumstances such as bad weather, road blocks etc. Arrive at Dehradun by early morning. Here, you'll board a private vehicle and travel to the village of Chakrate. The 3-hr drive takes you past small villages, eucalyptus plantations and vast farmlands. 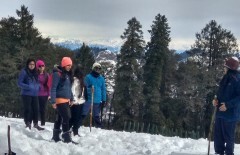 The trek begins from the outskirts of Chakrata, as you move from tar roads to wide trails inside dense, snow-layered forests. After a 3-hr trek, you'll arrive at the gushing Tiger Falls. Spend some time in the water, enjoy the scenery and board a private vehicle to Devban, travelling past vantage points of beautiful Himalayan views. You should arrive at your campsite by late afternoon. Overnight in tents at Devban. 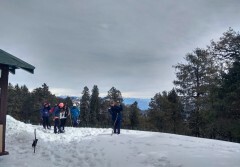 Trek over wide mountain trails painted white with thick snow. An early morning trek will take you uphill on a well-marked route until the village of Devban, a small community of shepherds and farmers. Soon, you'll enter a denser forest with increasingly thicker snow on the trail. A brief stop at the Devban Forest Rest House later, you'll reach the Vyas Point, the highest location in the Undawa forests around Devban. 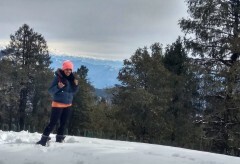 Spend some time with breathtaking views of the faraway peaks and retrace your steps back to Chakrata. Here, you'll board a private vehicle back to Dehradun. Your trip ends here. Overnight in tents at Devban. Today's meal package includes breakfast, lunch and dinner. All meals will be vegetarian. You'll be accommodation in tents at a campsite near Devban. The tents will come with a mattress and sleeping bag. Today's meal package includes breakfast and lunch. You'll return back to Dehradun by evening. The tour operator will arrange your transport to the start point of the Devban trek.